Site visits and dust sample collection were conducted at Senator Beck Basin, Grand Mesa, upper Gunnison Basin, Spring Creek Pass, and Wolf Creek Pass sites on June 1 and 2. Snowpack conditions experienced a major turnaround in late May thanks to heavy and even record precipitation. Under clear and sunny skies, May snow was rapidly melting even though a comparatively weak merged dust layer was only beginning to emerge at the surface of the lowest elevations of remaining snowcover. Dust emergence continues as of this writing. Streamflows were surging by early June to high levels not well predicted by previously identified ‘best fit’ WY 2012 and 2007 hydrograph patterns. Wet weather is returning and could result in further surging in streamflows from the combined effects of heavy rain below snowline and heavy rain-on-snow beginning Thursday, June 5 and over the following weekend. Forecasts continue to anticipate a wetter than normal June, July, and August. No new dust-on-snow events were observed by CODOS at the Senator Beck Basin (SBB) sentry site since the D3-WY2015 event of April 14/15 (see Dust Log). The total WY 2015 mass of mineral dust deposited to-date at the Swamp Angel Study Plot in SBB, from events D1 (April 2), D2 (April 8) and D3 (April 14/15), is 2.048 grams per square meter (2 g/m2), a small fraction of the dust depositions observed by in prior seasons (see Mass Loading Data). June dust-on-snow events are comparatively rare. During this partial CODOS circuit, a (merged) dust layer containing dust events D3 and perhaps D2 and D1 was on the verge of emerging, or had emerged, at the snowpack surface at Swamp Angel Study Plot, on Grand Mesa, at Kebler Pass near Crested Butte, and on Wolf Creek Pass, and on nearby high elevation terrain at Spring Creek Pass. Snow albedo was visibly but not dramatically reduced by this dust emergence. Samples of this “all layers merged” dust were collected (except at Spring Creek Pass) for chemical and other analyses by our USGS collaborators (photos below). Snow profile #23, on June 1, 2015, at Swamp Angel Study Plot. The merged dust layers D3/D2/D1 are seen as a very faint band some 4” below the surface. Rain-on-snow during May leached that merged dust into underlying snow, reducing its visual intensity. The thick, darker bands several inches below are clear ice. This snowpack had lost 111 mm (4.37”) of SWE since Profile #21 on May 19, when it contained our measured season maximum of 597 mm (23.50”) of SWE. June 1, 2015 snow profile at the Grand Mesa CODOS snow profile site. Dust from events D3, D2, and potentially D1 was diffusely present throughout the top 3” of the snowpack but had most strongly concentrated, during melt infiltration and rain-on-snow, into the brown band some 3” below the snowpack surface. Some small reduction in snow albedo was already underway and would increase quickly, as melt revealed the more intense band of dust. 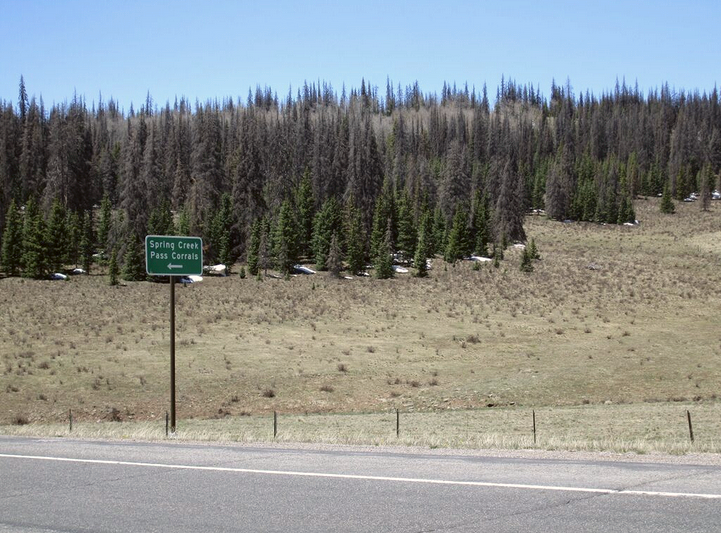 Samples of the merged D3/D2/D1 dust were collected at a lower elevation on the south flank of Grand Mesa, at the Crag Crest trailhead, where the dust had been blown into and concentrated in old snowmobile tracks. These concentrated samples are sent to our USGS collaborators for chemical and other analyses, and spatial comparison with those properties at other CODOS sites. These “all layers merged” (ALM) samples are not constrained to a specific surface area and mass loading is not calculated, due to the variety of wind conditions at CODOS sites. Mass loading sampling requires favorable site properties for uniform dust deposition, as exhibited at the Swamp Angel Study Plot at Senator Beck Basin. Due to the lack of snowcover at the Park Cone CODOS site, having long-since retreated to much higher elevations, an “ALM” sample was collected of merged dust layers D3, D2, and potentially D1 at Kebler Pass, west of Crested Butte. Snowcover was thin and rapidly disappearing here as well, at only 10,000’. Dust was becoming widely exposed on solar aspects in this locale. The dry Spring Creek Pass CODOS snow profile site is seen in the distance, on the open slope in front of the trees still containing scattered patches of snow. “ALM” samples are not collected in forest cover due to the large quantities of vegetation debris in the snow. Wolf Creek Pass CODOS snow profiles are performed on the roughly level ground in the foreground, where grass is seen protruding from the snow. Snowcover on the ski area in the distance showed patches of emerging dust, as also seen on approach to this site and in the foreground. However, a thin remaining layer of the recent, clean new snow still obscured the underlying dust over most snow covered terrain in the Wolf Creek Pass locale. An “ALM” sample of merged D3/D2 and possibly D1 dust was collected in exposed patches on the fringe of snowcover at the Wolf Creek Pass CODOS site. As previously discussed, winter 2014/2015 has been the least windy season in the period of record at the CSAS’s Putney Study Plot (PTSP), a partial explanation for this season’s lack of dust-on-snow. In particular, during the spring dust storm season, both March and April 2015 were the least windy of those two months in our period of record, and May 2015 tied with May 2006 (to the mile) as the least windy months of May in the PTSP and CODOS period of record. A chart of total “miles of wind” (MOW) at CSAS’s Senator Beck Basin Putney Study Plot (PTSP), by month, for winters 2004/2005 through 2014/2015. Winter 2014/2015 produced the lowest total “miles of wind” in the PTSP period of record, some 10,000 MOW below the working mean MOW (far right column). During this circuit of the Senator Beck Basin, Grand Mesa, Upper Gunnison Basin, and Rio Grande Basin CODOS sites, only two new snow profiles could be performed, at Swamp Angel Study Plot and at Grand Mesa. The CODOS snow profile sites at Park Cone, Spring Creek Pass, and Wolf Creek Pass had already experienced or were on the verge of “snow all gone”. New snow profiles are posted on the Senator Beck Basin and Grand Mesa CODOS webpages. As expected, both snow profiles were completely isothermal, at 0° C throughout, and contained very wet snow, approaching slush, in the near-surface layers. Grand Mesa did retain extensive snowcover on the Mesa proper but had virtually no snow remaining on its flanks. In the Gunnison Basin and San Juan Mountains, snowcover was generally confined to terrain at or above treeline on all but north aspects, where some snow was present below treeline, in forested areas. Shallow snowcover on the Grand Mesa, on June 1, was beginning to reveal large openings over wetlands and stream channels. Pools of slush and open water were observed over mostly snow covered reservoirs. A view on June 2 from “Windy Point”, on Slumgullion Pass, looking west across the Lake Fork drainage at Uncompahgre Peak (14,309’) in the distance. Snowcover was confined to terrain at or above treeline on these east and south aspects. Looking southwest on June 2 across the Brown Lakes and Hermit Lakes at Rio Grande Pyramid (13,821’). Snowcover extended somewhat below treeline on these northerly aspects. The view on June 2 looking northeast from Molas Pass of Kendall Mountain (13,338’) on the left, immediately above Silverton, and assorted high terrain to the south of Kendall Mountain. Snowline was retreating above treeline on these southwest and west aspects. May 2015 produced abundant and even record amounts of precipitation throughout the Colorado mountain system, much or most of it as snow. Although most Basins had experienced significant losses of snowcover earlier, May did produce some rebound in or maintenance of snowpack SWE in all Basins (and Peak SWE in the South Platte Basin), as seen in the basin-scale SWE plots below, combining all Snotel data in the respective watersheds (and Statewide). At all but one of the fifteen Snotel sites that CODOS routinely monitors, very poor March/April/May precipitation totals as of May 15 were largely reversed by the end of May. Under the CODOS Dust Enhanced Runoff Classification criteria for precipitation, conditions by the end of May had improved from DRY Spring conditions at all but two sites to AVG or WET Spring precipitation conditions at all sites (AVG Spring = median March/April/May total +/- 15%). Thanks to abundant precipitation in May, combined March/April/May precipitation values fell within the AVG Spring or WET Spring categories of the Dust Enhanced Runoff Classification scheme (above). The extremely wet latter half of May produced this reversal from the DRY conditions reported in mid-May (below). Here at Senator Beck Basin, our precipitation gauge at the Swamp Angel Study Plot (SASP) recorded 201 mm (7.91”) of precipitation during May 2015, exceeding our prior record of 190 mm (7.48”) in May 2011. At least one mm of precipitation was logged at SASP on 27 of the 31 days of May, 2015, versus on only 15 days in May 2011. Five numbered Winter Storms (>= 12 mm of water content, no break in precipitation of 12 hours) were logged in May 2015, tying May of WY 2011. Of that 201 mm of water equivalent this May, we estimate that only 8 mm fell as rain at that 11,060’ elevation; the remainder fell as snow. The period of record maximum for May precipitation at the nearby Red Mountain Pass Snotel, 2 km to the south of SASP, was in 1995, at 193 mm (7.60”). The strip charts below of WY 2015 and WY 2011 precipitation at SASP, and snowpack depth at SASP (11,060’) and at alpine Senator Beck Study Plot (SBSP, 12,180’) illustrate the highly erratic and infrequent storms of winter 2014/2015 precipitation, and prolonged dry periods, as compared to the more relentless, regular procession of storms in WY 2011 (see http://snowstudies.org/data/graphs/precip.html for similar graphs of prior Water Years and a link to the CSAS’s detailed Precip and Storm Report workbook). Precipitation and snowpack charts for the current WY 2015 and for WY 2011. WY 2011 produced 34 numbered Winter Storms, versus a total of 18 numbered Winter Storms in WY 2015 (to-date). Overall, the snowpack at Swamp Angel Study Plot recorded a net gain of 107 mm (4.21”) of SWE during May 2015, despite ongoing, low-rate snowmelt throughout the month. The nearby Red Mountain Pass Snotel (11,200’) and the Slumgullion Snotel (11,440’) near Lake City actually recorded Peak SWE values for WY 2015 during May, several weeks later than normal. Earlier snowmelt had substantially consumed the snowcover at Grand Mesa, Gunnison Basin, and San Juan Mountain Snotel sites monitors prior to May, but May did see either a rebound in SWE or a near-Peak SWE value in May at some sites (see individual CODOS site webpages for updated Snotel site SWE plots). However, despite the welcome, better-late-than-never snowfalls of May, WY 2015 snowpacks in Colorado still fell far short of 1981-2010 median SWE content in many basins and at many individual Snotel sites. Overall, as the Colorado Statewide plot of all Snotel data shown earlier clearly represents, the area underneath the plot of WY 2015 daily SWE values is substantially smaller than the area under the mean and median traces indicating a substantial deficit in SWE available for snowmelt runoff. At the scale of individual major basins, some fortunate storm behaviors favored both the South Platte River and Arkansas River Basins with the most ‘normal’ total available SWE, salvaged by the final burst of May snow. Elsewhere, despite May, the North Platte, Yampa, Colorado, Gunnison, Rio Grande, and southwestern River Basins all fell short, some far short, of accumulating normal snowpacks and SWE during WY 2015. Utilizing the CODOS Dust Enhanced Runoff Classification (DERC) analyses of WY 2006-2014snowpack, dust, and spring precipitation conditions, the May 18, 2015 Update presented ‘best fit’ historical hydrographs that could preview WY 2015 runoff patterns. Given generally LOW March 1 SWE conditions, MIN Dust to-date, and DRY Spring (March/April/May) precipitation conditions to-date, WY 2012 and WY 2007 offered the best, albeit imperfect, precedents from the CODOS period of record for how WY 2015 snowmelt runoff hydrograph patterns might continue to evolve. As stated in that May 18 Update, the short 2006-2014 period of CODOS observations has not yet captured all combinations in those three parameters, let alone the variability in Colorado weather behavior during spring. By mid-May, WY 2015 had already exhibited a new set of conditions within and even outside the DERC scheme that were determining snowmelt runoff behavior including very early development of isothermal snowcover unrelated to dust effects, significant rain and rain-on-snow events, and the most minimal dust loading observed in the CODOS record. Subsequent to that Update, heavy and even record precipitation during the remainder of May, as snow and rain, added yet another wrinkle to the pattern of WY 2015 runoff behavior. Although the impact on hydrographs of May rains at elevations below snowcover are beyond the scope of CODOS and the DERC approach, the addition of SWE at higher elevations and resulting AVG or WET Spring conditions increased the likelihood of increased streamflows and higher snowmelt yields once the stormy weather broke. However, during May, with no additional dust-on-snow events since D3 (April 14/15) the minimal dust present in the snowcover remained well buried throughout May and did not enhance the ongoing but low snowmelt rates producing runoff throughout the stormy May weather. Further, May’s snowfalls did not re-cool the remaining snowpack to any significant degree and rain on snow may have added heat to some lower elevation snowcover. Thus, the snowcover remained effectively isothermal throughout the month, sustaining some snowmelt discharge augmented by rains below snowline. Finally, in very late May and early June, clear skies, the sun, and much warmer and drier weather returned. Corresponding increases in solar (shortwave) radiation from rapidly lengthening days and higher sun angles, increased thermal (longwave) radiation from increased absorption of solar energy, and higher air temperatures all combined to vastly and very rapidly increase the snowmelt energy budget at the snowpack surface, even with very high snow albedo in clean May snows. As a direct result, virtually all headwater hydrographs that CODOS monitors presented a very steep and large surge during the last days of May and early June from relatively static or slowly increasing May streamflow levels. Some of these surges coincide well with normal peak flow timing and exceed median peak flow levels. This recent surging to normal or higher peak flows is not seen in WY 2012 or 2007 hydrographs. And, in the locales recently visited, dust-on-snow, and reduced snow albedo, did not play a significant role in producing this recent surging, to-date. In the watersheds recently visited, this surging has occurred with comparatively high snow albedo that has only begun to decline as merged dust layers D3/2/1 continue to emerge at higher elevations and on shadier aspects, above 11,000’. As large scale dust emergence accelerates, barring new snowfalls, reduced snow albedo will add an additional increment of absorbed solar energy to the snow surface energy budget, albeit a smaller increase in dust–enhanced radiative forcing than all other recent seasons have produced, given this season’s MIN Dust. Unfortunately, as discussed above, May snowfalls (and total March/April/May precipitation) generally could not fully offset the poor snowpack development of the preceding winter months. Except perhaps in the South Platte and Arkansas River Basins, the current levels of snowmelt, soon to be enhanced by widely emergent dust, cannot be sustained for as long as would occur with more normal snowpacks. Discharge levels may continue to remain high for a short period, especially if augmented by heavy rain, rain-on-snow, and reduced snow albedo from emerging dust, but the remaining snowcover may be very quickly depleted leading to sharply declining snowmelt runoff. Heavy rains in coming days (see below), a rainy June, and the residual soil moisture produced by heavy Fall 2014 rains (also from the remnants of tropical storms) may all mitigate, to one degree or another, the rapid ablation of the remaining alpine snowcover. As of this writing, Thursday, June 4, 2015, the National Weather Service Grand Junction office expects the recent sunny and dry weather to end today, followed by a return of wet and cooler weather. Moisture drawn northward from the remnants of eastern Pacific tropical storms Andres and Blanca may result in periods of heavy rain, particularly in the southern mountains and valleys, according to a Special Weather Statement issued at 0559 AM MDT. Snowmelt rates may accelerate with significant rain-on-snow, and rain below snowline will also contribute to already high streamflow levels. Drier, sunnier weather returns briefly early next week, followed by yet another bout of moisture starting mid-week. CPC’s 6-10 day precipitation outlook for June 9-13, as of June 3, 2015. CPC’s 8-14 day precipitation outlook for June 11-17, as of June 3, 2015. Farther out, CPC’s May 31st three-month precipitation outlook for June, July, and August continues to project increased probabilities of above normal precipitation for Colorado. CPC’s three-month precipitation outlook for June, July, and August, as of May 21, 2015. Final site visits will be conducted in mid-June at the remaining Northern Mountains, Central Mountains, and Front Range CODOS sites to collect as many samples of “all (dust) layers merged” samples at the snowpack surface as possible, and to observe this year’s dust deposition as widely exposed as possible in those locales.